Lock in a great price for Sentido Blue Sea Beach – rated 8.6 by recent guests! Location was great. Lovely beach, just across the street. Great food, lots to choose from - go for the all inclusive option. Mini club was very nice; our kids (9, 7, 4) all enjoyed it very much. Friendly staff, especially at the main restaurant. Beautiful resort, fabulous room with private pool overlooking the beach and Sea, immaculately clean. Great choice of food at the buffet restaurant and the a la carte experience was superb, fillet steak was amazing! Would highly recommend for a peaceful relaxing and luxurious break. Staff were very friendly and helpful. Got a room upgrade! Room was next to the pool and the beach and had a private sub chair. Room and bed were really comfy. Hotel area is really nice and calm, lots of plants and greens. Also got a spa voucher, used it for a massage which was really relaxing. Awesome breakfast with incredible options, hotel was fully booked, but service was always well organized and super helpful and friendly. I wanted to stay longer, but unfortunately this was not possible. Comfortable bed but room and bathroom good, not anywhere near outstanding. Some staff very friendly, others not so much. Sandy beach and plenty of bars and restaurants nearby. Good for short break. Nicely located beachside, with a small village on either side with tasty, well recommended restaurants. The grounds are covered in beautiful fruit trees and flowers. The restaurant is very tasty. Nice pools, overlooking the sea. Great friendly service from all of the staff. Kids club was well utilized and appreciated. In general, friendly and helpful staff. Close to airport. Most of the staff were pleasant but the ones who counted - Dimitra and the pool bar guy were pretty shocking. Loved the sea view which we had, the beautiful grounds of the complex and the choice of food at breakfast. We've been staying in this facility before in the past and we always love it! Sentido Blue Sea Beach This rating is a reflection of how the property compares to the industry standard when it comes to price, facilities and services available. It's based on a self-evaluation by the property. Use this rating to help choose your stay! Offering 2 restaurants and a spa with indoor pool, Sentido Blue Sea Beach is a 5-star beachfront resort located in the famous resort of Stalis. Rooms have furnished balconies with views of the sea or the property’s exotic gardens. The air-conditioned guest rooms are equipped with a satellite TV and a fridge. All guests are greeted with complimentary bottle of wine, fruit and water. Free WiFi is available in public areas. The on-site spa features a fitness room, massage rooms, sauna and steam bath. Water sports are featured on Stalis beach. Rich buffets including Cretan specialties are served for breakfast, lunch and dinner at the main restaurant. The resort's à la carte restaurant proposes Mediterranean flavors, including diet and vegetarian menus. Sentido Blue Sea Beach’s daily animation program will keep younger guests busy. Children enjoy their own sweet-water pool, while a mini is also available. Heraklion International Airport is 20 mi away, and the port is 21 mi away. Parking is free within the premises. When would you like to stay at Sentido Blue Sea Beach? Built between the grounds of the hotel, all the view of the grounds rooms feature a furnished balcony. These rooms have a magnificent view of the sea. These bungalows enjoy magnificent view of the the Stalis beach or the main pool. Main features include 2 wooden sun beds on the veranda. They can be either beachfront or poolfront. Set among the exotic gardens of this Stalis hotel, the elegantly furnished junior suites offer a furnished terrace. On the hotel grounds, these seafront suites open out onto a spacious terrace, just in front of the private pool. Fruits and water are offered on a daily basis and coffee and tea facilities are available. This suite features a bathrobe and seating area. This suite has a terrace, patio and air conditioning. This family room has a tile/marble floor, satellite TV and air conditioning. This suite has a seating area, patio and satellite TV. When you wish an affordable and restful holidays, look no further than the SENTIDO Blue Sea Beach, a traditional, natural and charming place. The hotel complex stretches along the Sandy Stalis bay, all surrounded with beautiful gardens. 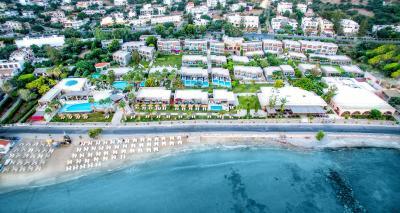 Situated between two famous for their night life resorts Hersonissos and Malia. The combination of a relaxing atmosphere, nightlife and interesting sights make the resort an excellent choice for a relaxing vacation. House Rules Sentido Blue Sea Beach takes special requests – add in the next step! Sentido Blue Sea Beach accepts these cards and reserves the right to temporarily hold an amount prior to arrival. Balcony door was broken, terrace was next to wall and thwre was a terrible smell. We wanted to change the room, but rhey said not possible. Alaso thwy asked 4 euros per day to use sunbeds in the beach. No prper coffee in the breakfast. You can order coffee from the bar, but opens from 10 o’ clock. Hardly anything I can complain about. The beach strip is narrow and the sun chairs quickly occupied, but this didn't bother me. The beach is perfect for swimming, shallow and almost no waves. The location is a bit off from the Malia center, so if you want to have dinner in town you need to walk a bit until you get to a good Taverna or restaurant (go to Katerina Taverna! ), but a lot of the usual bars and restaurants are just next to the hotel. Very busy main road adjacent to hotel. In our room, we could hear traffic all night into early hours. We asked for a quiet room via email but this wasn’t it! Somewhat plain room décor. Pools are a little tired. Check-in process is pretty lengthy, with a detailed questionnaire. Beach is nice, but small. Internet works, but cut out randomly around the grounds. Red tape. Service low. Food horrible at dinner. The red tape upon arrival was horrible. The room was not properly cleaned and poorly equipped - we had to ask several times for towels, blankets shampoo etc. Quality of cleaning, superficial and not reflecting the star rating. Beach across road, narrow, unattractive and not free for B and B customers. Pool area small for size of hotel. Uncomfortable beds. Wi-fi slow and signal poor. Bitterly disappointed with this hotel. It is NOT a 5 star establishment and this was evident both in the quality of the hotel, the attitude of the manager, etc I would like to erase the memory of this hotel as soon as we leave tomorrow so have decided to do it before we even leave! This was booked as a very special occasion with my sister and our partners, celebrating her 50th birthday - today in fact! Where do I start - maybe with the good: Yes, very clean but one would expect this from a 5-star resort Staff all very pleasant and work hard - again, to be expected from a 5 star resort Now for the bad. The very, very, very bad! This hotel fell far short of our experience of 5 star establishments. First time I have ever been told 2 single beds shoved together constitute a “standard double room”. What?? The beds continually slid apart last night. Not only that, they we’re individually made up, down to single sheets and a double cover over the top. ** they corrected this for the 2nd night by placing a double mattress on top of the beds - this was ok, however the linen didn’t fit! All inclusive is what we paid for, what we got, amazingly, is a vast selection of AI drinks and food which are actually not included in AI! I mean it goes on and on and on! The cocktails for AI are the worst syrupy, straight out of a dispenser, revolting concoction you could ever expect to come across! And I don’t drink much so for me to complain about “only local fare” is a surprise. Mythos, a Greek beer is €3.50 on the room service menu, which, by the way, you guessed it, is not included in AI We have raised our complaints and were offered a room change - why would we do that when we are (thankfully) only here for 2 nights! Disappointingly, my sister will never have a 50th again, and after 11 days in West Crete, which were amazing, this special occasion has ended on a sour note. You must pay €4 per person per day for go to the beach. If you take all inclusive option is free. The rooms was small for being a 5 star hotel. We thought the room was a little on the small side for 3 people (2 adults, 1 child). It was fitted out for 2 people (a double room) with the addition of a camp bed for the child which was inadequate. We requested a thicker mattress to place on top and this was provided which helped a bit. We also thought it would be helpful if we were provided with a "do not disturb" sign to alert the maid not to enter in the mornings whilst we were still in bed.